On the evening of January 28, 1902, Captain R. F. G. Candage, then President, gave his first report of the new society; it has continued with success until to-day, when his successor appears before you on its fourteenth anniversary. The past year has been marked by no especial results, and the membership has not greatly changed, numbering at the close of the year 4 benefactors, 27 life members and members and 207 annual members, making a total of 238 members. Six of our members have died, namely: Mrs. Clara Perkins Fish, a life member; Mr. Charles H. Rutan, a life member; Miss Mary E. Wood; Percy Chase, M.D. ; Mr. James L. Little; and Mr. James N. North. All were valued residents of the town, and their loss is greatly felt in the community. Mrs. Clara Perkins Fish was the wife of the well-known lawyer, Frederick P. Fish, of Brookline. She was the daughter of Rev. Mr. Livermore, a Unitarian clergyman, and had lived in Cambridge for many years before coming to Brookline. Mr. Charles H. Rutan was a member of the firm of Shepley, Rutan & Coolidge, architects, of Boston, and was one of the leaders in his profession in this country. His firm has built many of the leading buildings of the United States. He lived for many years on Davis Avenue, but recently moved to an apartment at the corner of Boylston Street and Buckminster Road, where he died. He was a devoted member of the Harvard Church, and a most worthy man. Miss Mary E. Wood was the daughter of a former resident of the town, Amos L. Wood, who lived for many years on the corner of Harvard Street and Linden Place, now occupied by St. Mary's Catholic Church. There was a pretty garden connected with this house, running along Harvard Street to what was the Homer estate on Homer Street. Miss Wood lived at the corner of Washington and Thayer Streets. Dr. Percy Chase came to Brookline about 1907, from Lynn, and lived first on Walnut Street, and afterwards on Addington Road. He was a physician, but I think he did not practise his profession. Mr. James L. Little came to Brookline in 1878 or '79, and lived in a fine old mansion on Goddard Avenue. He was a genial, courteous gentleman, and always had a pleasant word with those he daily met. He and his brother, John Mason Little, were the owners, or principal owners of the Hotel Pelham building on the corner of Boylston and Tremont Streets, Boston, which was moved back a number of feet when Tremont Street was widened some years ago. This was regarded at the time as a great engineering feat. The widow of Mr. Little survived him but one day. Mr. James N. North had resided on Beacon Street nearly twenty-five years. He was the president of the American Soda Fountain Company. Among our leading citizens who have died during the year, especial mention should be made of Mr. George F. Arnold. Although not belonging to this society, his wife has long been an active member. Mr. Arnold was not a strong man physically, and was not engaged in any calling, except to do all the good he could in the world. His was a lovable character, and he will be greatly missed. Another gentleman, Mr. Spencer W. Richardson, who, though not living within the limits of Brookline, was intimately connected with the town, passed away during the year. Mr. Richardson came to Brookline with his father's family in his boyhood, and lived in a house on Walnut Street, which was taken down a few years ago to make room for a house built by Mr. B. F. Carroll. 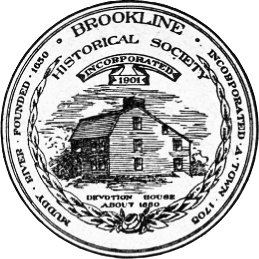 He attended the Brookline High School in 1850 or '51, and afterwards entered the office of William Dwight, who was a prominent banker in his day. Mr. Richardson afterwards went into the banking business with the late William H. Hill of Brookline, founding the wellknown firm of Richardson, Hill & Company of Boston. Mr. Richardson was one of five brothers who went to the Civil War, none of whom are now living. He was a member of the G. A. R., and his presence on Memorial Day is well remembered. January 22. The annual meeting, at which officers were elected, and the President made his address. February 25. "What is an American? The Observations of an American Fanner before 1775," by our member, Mr. Charles F. White. Your President had an engagement on that evening, and his place was filled by the Vice-President. As I was not present, I cannot pass upon the merits of the paper, except as I know the reputation of the writer, who has been such a help to us during all these years. March 27. "The Keeper of the King's Conscience," by Honorable Henry K. Braley, Justice of the Massachusetts Supreme Court. There was a heavy downpour of rain on that evening, and but a small number were present to hear one of the most scholarly productions that have been given before our Society. Judge Braley gave a description of the office of Chancellor of England, who, as the title recites, is to a certain extent the keeper of the King's Conscience. April 16. "China, the New Republic," by Mrs. Morrill Hamlin of Portland, Maine. A large audience was present to greet her. Mrs. Hamlin spoke most interestingly, and without notes. She felt that the New Republic had made a good start, though with tremendous odds, and that its president was a strong, progressive man. May 28. "Reminiscences of the Civil War, particularly some episodes in the history of the Fifty-fifth Massachusetts Regiment," by Professor Burt G. Wilder of Brookline. This meeting was held in the Grand Army Room, and the members of the Post had been invited to be present. Professor Wilder, who is one of our members, gave an extremely interesting talk about the life in this colored regiment in the low, flat country about Charleston, and he mentioned several of his fellow-officers who had homes in Brookline, and were well known to most of us. The occasion was most appropriate to Memorial Day, which followed so soon. October 22. "Highways and Byways of Boston; how they were formed and how they are named," by Walter Kendall Watkins. The taking title of this talk, together with the fame of the well-known antiquarian, brought a large gathering and the interesting information about old Boston well repaid those who were present. Mr. Watkins' knowledge of old Boston is marvelous. November 19. "How the Eagle Came to be our National Emblem," by John Stuart Barrows, who told us of the long controversy both in the National Congress and in a committee, in the attempt to get a suitable emblem for the Nation's Seal and Coat of Arms. Benjamin Franklin was one of this committee, and he did not approve of the eagle being used to represent us, as it was, he said, "a dirty, unclean bird, of greedy and rapacious habits." December 17. "The Brookline Fire Department," by Miss Ethel H. Forbes, who is a graduate of the High School, where the paper was originally given, and for which she received a James Murray Kay prize. It gave a description of the growth of the department, particularly in the early days of the town, when the first engine had to be supplied with water by buckets. It told of some of the mishaps of the department, and of the increasing efficiency of the machines, up to the present motor engine. The addition to the Devotion Schoolhouses, which last January was in process of construction, has now been finished, dedicated and is in use. I called it an addition, but the immense new building dominates the group of school buildings, and makes a most impressive background for this fine quadrangle, with our little old-fashioned house in the foreground, a delightful mingling of the new and the old. The new school building has been described in our local papers, but it should be seen in its entirety to justly estimate its size and utility. The fine and complete gymnasium in the basement, the series of long recitation rooms, each with a sunny exposure, and, crowning all, the spacious and beautiful hall, seating more than our Town Hall, are very impressive. To an old resident like your president, there comes to mind the little old building on School Street, where he first went to school, a dingy two-story building, not adorned by tree or shrub. This was situated about where Prospect Street opens from School Street. Originally there had been a high hill where is now a gentle rise on which the present Pierce Primary is located. The hill had been dug into from the Harvard Street side, and the steep, ugly gravel bank was at the back or side of the schoolhouse. School Street was a mere lane, with barberry bushes along the side, where the children used to play house at recess. The one redeeming feature of the surroundings was the pretty meadow across the road, which in those days occupied the space now filled with apartments, and there the brook flowed, unhampered by stoned banks. This was called the North Primary School. heirs of the late Mrs. Amy Cabot. Mr. Michael Driscoll, a few years ago, wrote a very interesting and full description of this school, which finally has evolved into the present commodious Heath School. The third, or South Primary School, also known as the Putterham School, still stands on Newton Street, near the pumping station. The building has been lengthened from its original size, but its style and form remain the same. It is interesting to read in the Town Records the long-drawn out discussion as to the proper way to make this enlargement. It was decided to make the building eight feet longer, and a minute description as to how many new windows and how many new desks is given. Then, when $125 had been appropriated, and a committee appointed to do the work, it was found that the town did not own enough land for the new addition, and 1500 feet were bought of Mr. Hill for five dollars, and the enlargement cost, with the land, $252. This addition was made in 1840. Then, in 1843, the first High School was opened in what was then the Town House, now occupied as Pierce Hall by the First Parish Society. In 1845, the second Town House was erected on the site of the present building, and in the lower story was established what was called the Intermediate School, containing two rooms, one for boys, and one for girls. This school was opened in the spring of 1846. The other declivity of the hill before spoken of came down to Washington Street, and it had to be dug away to make room for the Town Hall. The same conditions existed there as on the School Street side, a big gravel bank directly behind the schools making a fine place for the scholars to run up and tumble down, but not greatly appealing to the aesthetic side of child nature. This school was continued for a few years, until the rooms were needed for the town's business, and until a graded grammar system was established. In 1849, in the first printed collection of Town Reports, the whole appropriation for Education in these five schools was $3500, distributed as follows: High School, with two teachers, $1,557.00; Intermediate School, with two teachers, $1,012.45; North Primary School, with two teachers, $510.43; Middle District, with one teacher, $251.00; and South District, with one teacher, $213.83. This covered all the expense of heating, cleaning, etc., and at the end of the year, $54.75 was returned to the treasury. In 1914, $276,085.00 was appropriated for education, and the School Committee had to come to the town for more money, and at the last Town Meeting, in December, sixteen hundred dollars more were appropriated for educational purposes. Perhaps nothing more than the above could so directly show the growth of the town, and of what is considered necessary for a child's education. It sometimes seems as if too much were done to-day, and that the former conditions were more favorable for making a vigorous, virile character. The town continues to grow, especially in the northern part; the increase about Coolidge Corner is most marked. A great impetus to the growth of this section of the town was given by the widening of Beacon Street in 1887, and the establishment of the trolley line thereon. In 1886, nearly all the land north of Beacon Street was occupied by farms. There was vacant land of the farms of the Babcock, Coolidge, Griggs and Corey families. At that time there were on the south side of Beacon Street, from St. Mary's Street to Chestnut Hill Avenue, a distance of a little more than two miles, nine buildings, all but one of them wooden, and of but little value, and on the north side, twelve, three of them of brick. Today, these farms are nearly covered with houses, and Beacon Street is lined for the greater part of the way with brick and stone buildings. A fine mansion built about thirty years ago on Beacon Street, near Charlton Street, has recently been taken down, and the land is to be occupied by apartment houses.